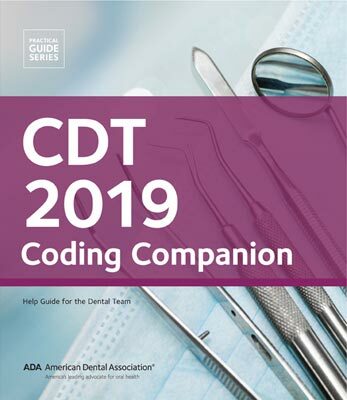 CDT 2019 Companion dental coding guide will improve your understanding of dental coding. Reduce rejected claims, use CDT Code to ICD-10 Diagnosis Code Cross-Walk (dental to medical diagnosis). Companion guide features dental to medical cross coding with ICD10 diagnosis codes. Train your staff to code more accurately and efficiently, with key coding concepts, scenarios, and Q&A. Use the CDT 2019 Companion: Help Guide for the Dental Team, along with CDT 2019, to enhance the knowledge of current staff or as an orientation tool for new employees. This resource is organized by coding category, and developed with the oversight of the ADA Council on Dental Benefits. Take a chapter at a time to review at staff meetings or use it as a handy reference guide for common coding conundrums. CDT Code to ICD-10 Diagnosis Code Cross-Walk, information linking the codes of one system with codes of another. Cross coding from dental codes to medical codes (diagnosis). The Companion was developed with the oversight of the ADA's Council on Dental Benefits and Practice to ensure the information is as accurate and up-to-date as possible. Organized by coding category, each chapter was written by a dental expert, including coding consultants, insurance administrators and practicing dentists.